The second-season form was also undeniably better. The series toying with its audience added another level of humor, or at least irony, to the proceedings; the serialization gave weaker characters like Ryan's sister the chance to become interesting; and certain long-term character additions, especially Allison Mack's Amanda, added depth to the show. But while this was generally better for Wilfred as a whole, it didn't necessarily mean that the simpler format of Wilfred teaching Ryan a lesson was useless—just that those kinds of episodes have to stand out more in order to keep up. Tonight's “Shame” fits that description of a standalone episode that also stands out. It is, once again, essentially a three-character play with Ryan, Wilfred, and the guest star (although Jenna shows up twice to keep the story moving.) 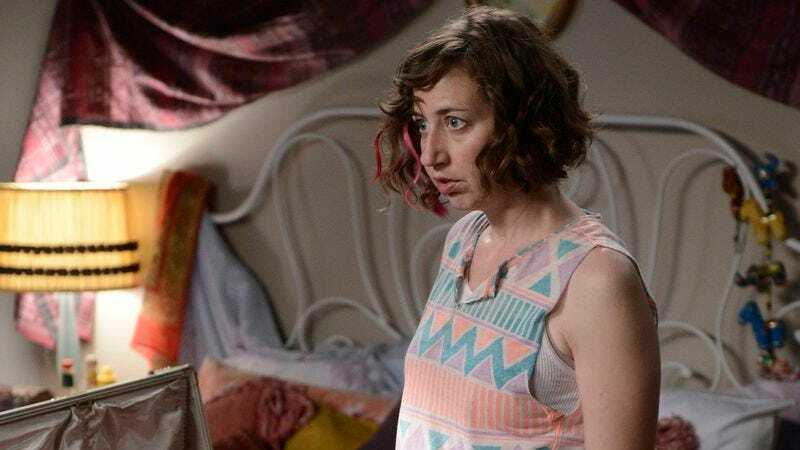 It's helped by the fact that the guest star is Kristen Schaal, slowly working her way into appearances on every single Fox/FX comedy. She plays Ann, a slob whom Wilfred invites to live as Ryan's roommate against Ryan's will. She makes her living off of eating food on webcam, a fact that Ryan finds disturbing and Wilfred finds appealing, largely because she has all kinds of smells and food scraps for him. The theme playing out through the episode is a simple, though appealing one: Do what makes you happy, even if it seems abnormal. What makes it work is that the show manages to align how Ann is portrayed with Ryan's understanding of her. She does seem like a slob, and her line of work does seem creepy. Schaal's great at portraying that in the first half of the episode, but I also think there are subtler directorial choices, like typically framing her as unassuming, powerless, and from Ryan's point-of-view. So when Jenna tells Ryan that Ann has apparently stolen the newspaper and Ryan goes to confront her, he really does seem like the sympathetic one. And that's where the episode switches. Schaal's hurt feelings are immediately apparent, and Ryan quickly realizes that he's blown up at a woman for living her messy life in a largely harmless fashion. So retrospectively, she doesn't seem that bad. Yeah, her job is a little weird, but she does seem to have a system in place that protects her. So the lesson Wilfred teaches Ryan, that forcing Ann to be normal even when it makes her unhappy applies just as much to himself as it does to Ann, works despite the obviousness. It also reminds me of one of Bob's Burgers' best episodes, “Moody Foodie,” which served as a sort of mirror image to “Shame,” finding horror in a perfectly mundane office job during a dream sequence. Of course, it makes sense that television shows written by, well, writers, and put on by actors would glorify individualism and chasing fulfillment, but that doesn't mean that the theme isn't still resonant (…said the freelance writer). Less successful is the side plot of Wilfred eating so many of Ann's scraps that he turns overweight. Fat jokes are just about the laziest kind of joke around, not to mention often being simply mean-spirited and scientifically inaccurate. Wilfred doesn't do terribly with it—the jokes tend to be more about how the dog is out-of-shape—but it never really justifies its existence either. I wrote that this was a standalone episode at the start of this review, but that may not entirely be the case. “Shame” ends not with Ann moving out but with Ryan, and apparently Jenna, accepting her presence and allowing her to stay. If this means that Schaal is going to be around for a multi-episode arc, all the better. “It's not so bad. When I bend my knee like this it looks kinda like a mountaintop, with all the little craters. You know, like in Hawaii?” Ann makes a great first impression. “I gotta take a piss. Finish Bear off for me?” Yet another episode where that Perfect Wilfred moment comes in the tag. I never really noticed before, but when she was all done up for her normal job, Schaal really reminded me of Alyson Hannigan for some reason.